The peculiarly named Happy Birthdays is an ecosystem simulator conceived by Yasuhiro Wada, the mind behind Harvest Moon. Much like the iconic farming series, this “god game” is about managing your environment to produce something - in this case, entire species. By manipulating elements like temperature and terrain within a miniature cube, you can influence the creation of many lifeforms and experience their happy birthdays. The story follows your nameless avatar, who is transported to a mysterious cube world and transformed into a cute alien-like superhero. A small prism named Navi informs you that it needs your help with producing lifeforms on this cube planet. For some reason, by helping Navi, you can return home. It’s a strange story, but then again, this is an odd game. If you’ve played games like Spore, Viva Piñata, or Actraiser, you may feel more comfortable with the premise of Happy Birthdays. Essentially, you attempt to influence organism creation and reproduction by managing the temperature and structure of your cube world. There are several options for your starting world, such as a frozen planet or a lifeless rock, with the standard lush green habitat being the easiest to develop. Afterwards, you fly around as your alien superhero avatar, and your primary actions involve manipulating the ecosystem by changing the terrain height and activating skills. For instance, you can make an area colder by developing higher mountains or by using skills that manually cool the environment. A colder world may give rise to different species. Your goal is to create whatever lifeforms Navi requests, from dinosaurs to early humans. It goes without saying that these button-eyed creatures are extremely adorable, and it was a pleasure to encounter each one roaming about. The frame rate, though, does dip a bit depending on how much you have going on in your world. Each playthrough is fairly linear, and you’re never expected to produce anachronistic creatures, like dinosaurs in a modern age. But you are free to build the blocky terrain however you like. Designing the world isn’t as deep as other sandbox builders like Minecraft; you’re mostly limited to forming simple mountains, valleys, and fields. In the spirit of making a world my own, I would have loved more ways to personalize my domain besides a limited amount of constructible monuments. Nevertheless, the point is to generate a living ecosystem. It’s harder than it looks as there is a lot to keep track of. Opening the library submenu reveals almost 300 species waiting to be born. Each organism has specific conditions that must be fulfilled for its inception as well as for its continued reproduction and survival. For example, the Adelobasileus requires a temperature between 30-40 degrees Celsius, a moisture level between 9-63%, and for its ancestor the Diphydon to reach a population of at least 85,400. Every requirement in the game is precise, and it can be difficult to understand the on-screen statistics early on. I messed up a few times because the tutorial barely explained what I was looking at. Thankfully, the game is fairly forgiving and encourages experimentation. It’s also more valuable as an educational tool this way. As you play, you realize why species died out and the drastic changes the world underwent over long periods of time before humans came to inhabit it. The game even uses scientific names for each lifeform. It’s a surprisingly effective educational tool that simulates real biology in an interactive way. Manipulating growth becomes easier as you get the hang of it. The bigger challenges come with the clunky controls and navigating the unintuitive interface. For example, scrolling through the skill menu requires you to hold down a button while pressing directional controls, and sometimes you will suddenly lose and regain the ability to move depending on which submenus are open. You can access the species library both as a list and evolutionary tree, but there’s no way to search for the species or easily find one’s profile. This is most problematic for certain species which require specific ancestors to spawn in your world. You end up spending time navigating the large tree or cross-referencing the list just to find the ancestor’s profile, which becomes a chore. Nothing actually happens on the planet until you enter the game’s Macro Mode, which takes you outside your constructed world. From here, you can fast-forward time at a rate of several thousand years per second. That may seem fast, but it takes millennia for species to pop up. Even if you have correctly manipulated all the elements for a lifeform to appear, you may have to wait around for it to finally happen. Luckily, a status sidebar tells you everything that is happening, like which creatures are increasing or decreasing their populations and when one’s happy birthday has occurred. With every birthday, you can capture a species and formally add it to your library, which is great for anyone with a Pokemon gotta catch ‘em all mentality. Capturing species grants you experience points, which you use to further manipulate the land. Doing so lets you produce more species for you to capture. It’s an effective gameplay loop. Unfortunately, that’s about all you actually do in the game. You can’t interact with any of the species, and they do very little besides walk around and eat. 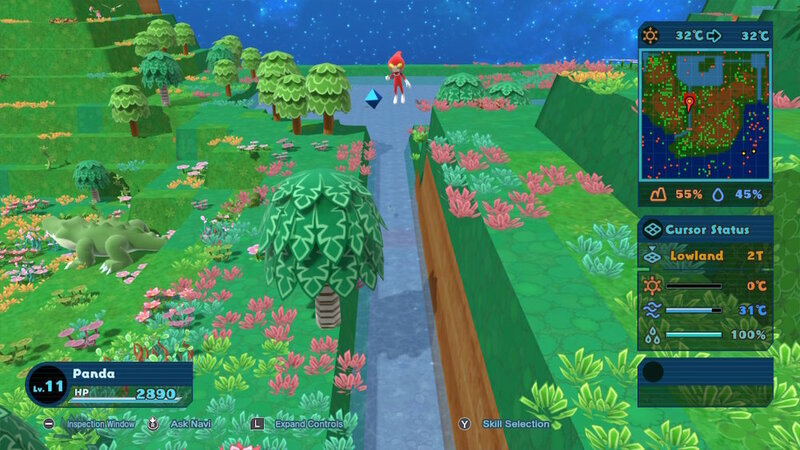 There’s a first-person view mode that lets you pretend that you’re part of your own created world. Otherwise, the game is strictly about changing the environment and waiting for progress. It’s relaxing to watch the world grow on its own, a sensation akin to looking at an aquarium. The soothing, quiet piano soundtrack accompanies the tone well, but it can get dull when nothing significant happens. The main campaign doesn’t take long, provided you have a good understanding of your ecosystem. Afterwards, you can play in Free Mode to try to unlock every birthday or simply to watch your ecosystem grow, which you can also do by restarting the campaign. There’s also a Challenge Mode with a handful of trials, each asking you to produce a lifeform under certain conditions. This mode is the closest Happy Birthdays comes to incorporating arcadelike gameplay, but it’s not as engaging due to its smaller scope. Happy Birthdays is a truly unique way to learn about ecosystems, evolution, and the changing world. As a game, its slow pace and passive gameplay isn’t for everyone, and its content isn’t necessarily enough to justify the fairly steep retail price. Happy Birthdays is a title that fosters experimentation and observation, but its demand on stat management may go over the heads of younger players. The game will appeal most to patient players seeking a scientifically influenced passive experience as it’s a cleverly designed ecosystem simulator with eye-opening parallels to real life. If anything, Happy Birthdays has given me a greater appreciation of how our world came to be. I am a lifelong gamer, having grown up with Nintendo since I was young. My passion for gaming led to one of the greatest moments of my life, my video game themed wedding! Boost Beast is an underwhelming take on the established match three formula. The few attempts Arzest make to set it apart backfire, making much of the game dependent on luck. You either lack the correct colors to defeat the zombies or you score ridiculously big boosts with very little effort, making even victory unsatisfying. Indie games have helped to revive the story-based adventure genre, whether through combat-free “walking simulators” like Dear Esther, puzzling open worlds as in The Witness, or evocative movielike experiences such as Journey. RiME takes pages from each of these games, telling a cinematic tale of a young boy who travels around a small island and solves environmental puzzles. The Nintendo Switch has had quite the launch year, with The Legend of Zelda: Breath of the Wild and Super Mario Odyssey leading an impressive array of games. Nintendo and developer Monolith Soft aim to finish the year strong with their massive RPG adventure, Xenoblade Chronicles 2. Though branded as a sequel, its story stands alone from the previous Xenoblade titles. While it shares similarities with its predecessors, its modified combat system and anime-inspired artstyle set it apart. Battle Chasers: Nightwar is a fusion of comic books and classic role-playing games with a fascinating history. The title is based on the late ‘90s comic Battle Chasers by Joe Madureira. It followed five diverse heroes in a medieval steampunk setting but was eventually cancelled as Madureira moved on to video game development, working on such series as Darksiders. As fate would have it, Madureira and other Darksiders veterans successfully Kickstarted a project that would revitalize the comics in video game form. Think about the most delicious food you’ve ever eaten. After savoring your meal, was your gut reaction... to throw your empty plate at the person across from you? This is how every single character in Sushi Striker: The Way of Sushido operates. Co-developed by Nintendo and indies0, known for fan-beloved games like NES Remix, Theatrhythm: Final Fantasy, and Retro Game Challenge, Sushi Striker is a fast-paced puzzle game with surprising depth.